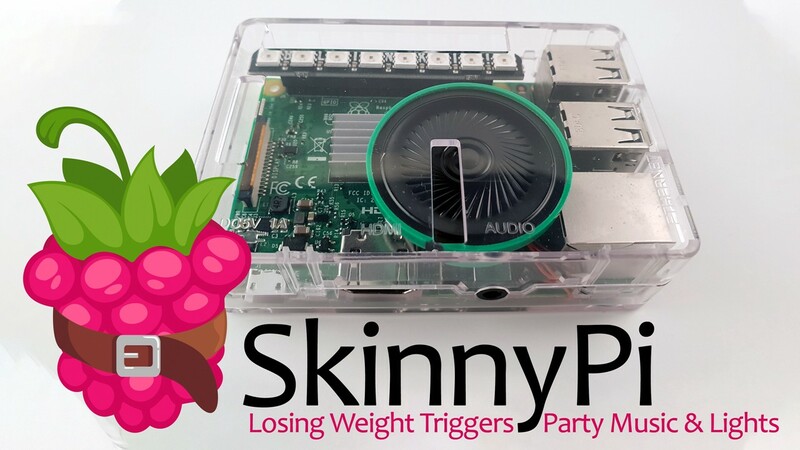 I thought it would be fun to setup a Raspberry Pi so that every time I lost weight, it would flash lights and play music. I referred to this as “Party mode” or “Happy Dance.” It would be positive reinforcement and a fun way to start my morning. Hopefully this is useful for someone or at least a great example of how to get your cloud services to communicate with your Raspberry Pi. You step on the Fitbit Aria Scale and it syncs over wifi to the fitbit server. 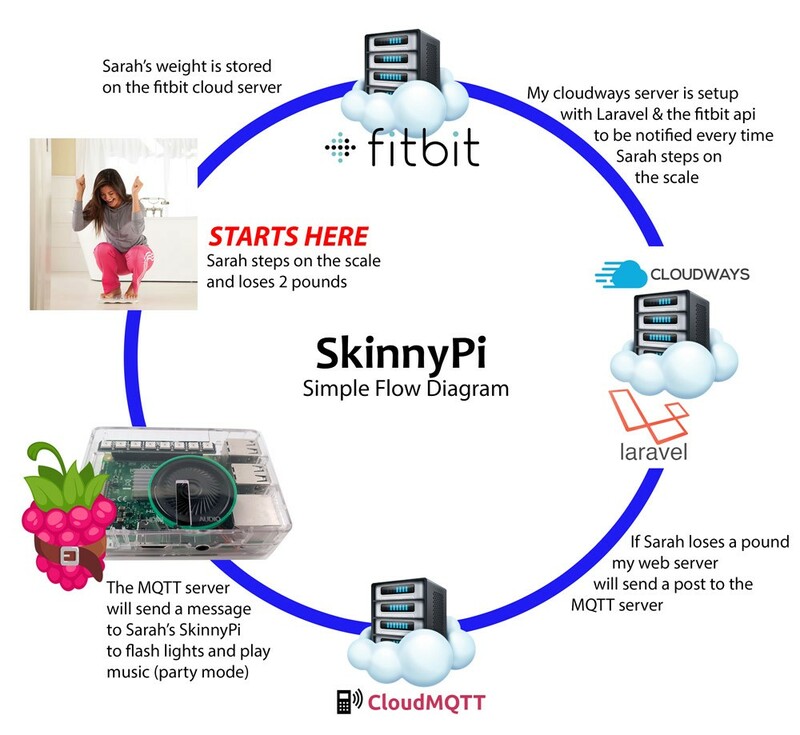 The Fitbit API triggers that a new weight was added and does a call to your cloud server. Your cloud server stores the new weight and calculates to see if it was higher or lower than the previous weight. If the weight is lower it sends a message to your MQTT service. I’ll assume if you are reading this that you know how to put together a raspberry pi. All the parts together will be about $60 so it is a fairly expensive project to build. Note: The package will automatically register itself using Laravel’s package discovery feature for versions 5.6 and above. This means you do not need to update your config/app.php file. There is no way the application can receive the notification data in the callback, fetch the notification details from fitbit, parse the notification, fetch the affected user, save the new weight log, do the weight comparison check, send the requested mqtt message and reply fitbit with the required ‘HTTP 204 No Content’ status all within 3 seconds in the callback. So you need to break it down into a couple steps to prevent fitbit from banning your api access. ‘Supervisor’ is a process monitor program that will monitor the queue listener process and automatically restart it in case the process crashes. Then we will run the http://your.domain.com/notification-detail/notification-details route to go through the notifications we have saved and create a request to fitbit to fetch the details of each of those notifications. It is in the response that we get from fitbit that we will have the weight that has changed. MQTT is a way to push and subscribe to messages and works well on Internet of Things (iOT) devices like a Raspberry pi. You setup the Pi to subscribe to a MQTT channel so whenever your server pushes a message to that MQTT channel then MQTT will automatically push it to any device subscribed. *Disclaimer - Links to recommendations, in this article, include my affiliate code. Jasmine Robinson, Entrepreneur, IT Director, Professional Full-Stack Web Developer, Graphic Designer & Product Manager.